The winds of March are blowing in a new series of manager’s specials. 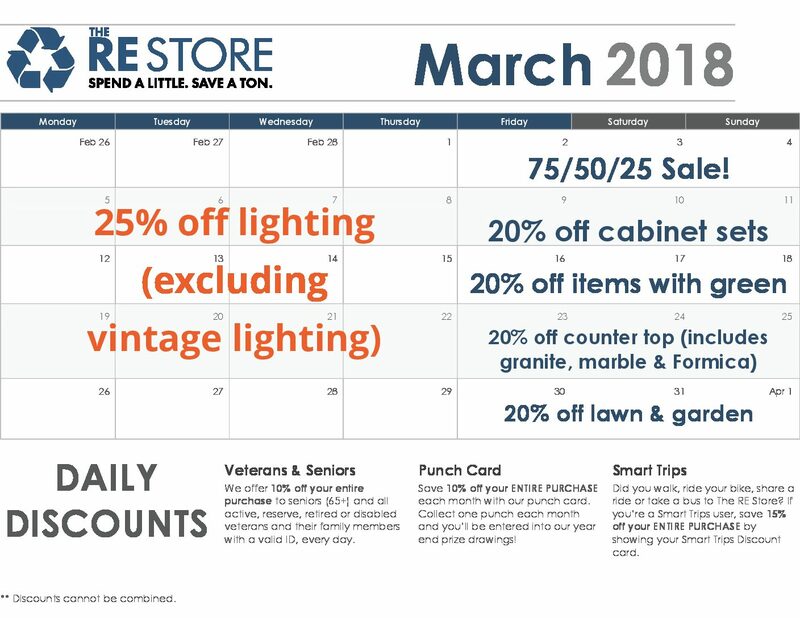 Starting off with a doozy, March 2nd-4th brings the amazing 75/50/25 sale: on Friday all iTek solar glass is 75% off, Saturday all garden items are 50% off, and on Sunday roofing, gutter, and decking materials are 25% off. If you’re looking to re-do your kitchen or organize your garage, consider a gently used cabinet set. At 20% off, your project will be a fraction of the price of new. Celebrate St. Patrick’s day with 20% off any item that has green on it. Cover your new cabinets with granite, marble or formica with 20% off counter top from March 23-25th. Prepare for April showers with 20% off lawn & garden items March 30th-April 1st.